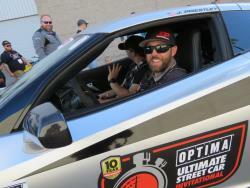 This year marks the 10th anniversary of the OPTIMA Batteries Ultimate Street Car Invitational and the 2017 OUSCI is in the books. 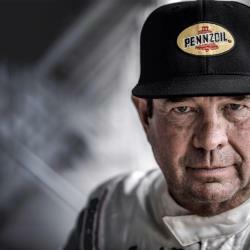 OUSCI was created by Optima’s Product Development and Marketing Director, Cam Douglass, and veteran racer and CEO and President of FM3 Performance Marketing Jimi Day. The event has drawn the most incredible talent from around the globe and this year was no different. AIRAID team drivers Jordan Priestley and Ken Thwaits have plotted, planned, built, and rebuilt all in an effort to be the “best”, to be the winner when it came to OUSCI. From attention to every detail that would wow and impress the judges for the Lingenfelter Design & Engineering portion of the event, to their decision to maintain the street worthiness of their rides making the Lucas Oil Road Rally comfortable and reliable, Jordan and Ken definitely brought their “A” Game to SEMA and the Las Vegas Motor Speedway. But the Road to Optima’s 2017 OUSCI hasn’t been simple for either competitor. They’ve faced challenges, experienced up and downs, but at the heart, they are every bit competitors. In fact, both of these gentlemen credit improved diets and exercise, along with a can-do attitude to their continued success. Explaining that even though they compete in street cars, these guys, these incredible brand ambassadors are determined to showcase their sponsors' equipment, the equipment that makes their street cars so darn competitive, in the best way they know how. For them, that means a podium finish whenever and wherever they can. 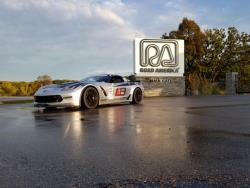 Throughout 2017, Jordan was actively competing, he and JDP Motorsports (the family-owned business) were busy with R&D on his JDP Motorsports AIRAID-equipped C7 Corvette, “Bernice”. Improvements included an LG Motorsports carbon fiber side skirts and front splitter along with an Anderson Composites dry carbon hood. To accommodate the new hood JDP Motorsports custom fabricated a brand new duct system sure to please the OPTIMA D&E judges. Thunderstruck Hot Rod & Custom Cycles handled the fit and finish details that perfectly compliment the 2017 Chevrolet Corvette’s already amazing body lines. All the while making changes and racing Bernice in events around the country. All the while, our AIRAID team driver was running a successful business and managed to relocate the family home! To say his plate was full would be an understatement! AIRAID team driver, Ken Thwaits; the man, the myth, the legend! Over 1,600 miles away in Nashville, Tennessee, AIRAID team driver, Ken Thwaits story wasn’t all that different from Priestley’s. Ken started his year with the USCA season opener at Las Vegas Motor Speedway coming away with a 1st place finish in the Powerstop Brakes Speed Stop Challenge and an overall 2nd place finish for the event. He seemed to be off to a great start in his AIRAID-equipped 2006 EVO. Thwaits would go on to the next USCA event at New Orleans Motorsports Park, Louisiana, where he would finish second behind Mike DuSold in GTL Class. 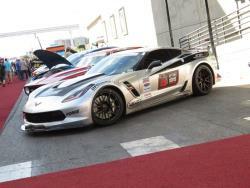 At the National Corvette Museum, even with gremlins challenging he and his Showtime Motorsports Team, he came away with another second-place finish. Once again the brass ring eluded him. But all was not lost. It was at NCM that he received the OUSCI Invite. It’s important to note that Ken Thwaits is first and foremost a businessman, second a “racer”! Owner of Showtime Motorsports and Apparel, Ken has stepped further into apparel with the recent opening of Franklin Road Apparel Company, a unique upscale men’s clothing store in Franklin, Tennessee. Turns out Thwaits happens to be more than just a great driver, he’s great dresser too. He saw a need for men and took action. He’s created the ideal men’s store with great brands, incredible customer service, flat screen tv’s and access to his private 25 car collection of vintage Camaros! We wouldn’t expect anything less from him. However, starting a new business isn’t all Ken had on his mind this past year. You may recall that at the 2016 OUSCI he suffered damage to the EVO’s top end that required a down and dirty, last minute, under the wire swap that afforded him just one run on the Falken Tires Hot Lap Challenge. That valiant effort unfortunately didn’t prove to be enough for him to steal the win from the three time consecutive winner, Danny Popp. Perhaps that alone was reason enough for him to work tirelessly on creating what he called a bulletproof package that would ultimately crown him victor at the 10th Anniversary running of OUSCI at Las Vegas Motor Speedway. But before that could happen, he had more qualifying to do! He suffered some mechanical setbacks, specifically a suspension break at New Jersey Motorsports Park. Turned out the lower control arm snapped on the autocross that required he and his team of Tyler Powell, Bob McCann, plus Graham Behan to get back to the drawing board if they were going to be able to make a serious run at OUSCI come November. Working with JJ Furillo from Ultimate Performance allowed them to design a suspension system that could take the punishment of Thwaits behind the wheel. The team suffered multiple blown motors throughout the year. During Speed Stop and Autocross the EVO ran flawlessly. However, on the road course, the motor ran too lean ultimately causing failure. Behan discovered that they would need to replace the fuel system to correct the problem and the team was back in business! Before OUSCI the Showtime Team elected to tear the car down to the bucket and rebuild it piece by piece stronger, better and even added a few aesthetic fit and finish touches handled by his friends at Triworks in Nashville in an effort to score higher in D&E. Ken was leaving nothing to chance this year. He was hungry for a win. You know what they say, number two always tries harder and he was going for broke! OUSCI is to say the very least one of the toughest events partly because it immediately follows the SEMA Show, which is really an event all in itself! So much to see and do, from the new products unveilings, educational seminars, sponsor meetings, and so much more. It can leave the SEMA newcomer feeling wiped out! But for our team drivers, Jordan and Ken, this simply adds to the excitement. This year OUSCI featured a new format that had the one hundred competitors racing head to head autocross in rotating run groups for the better part of Saturday, finishing the day’s activities with the Lucas Oil Road Rally with the final destination a tailgate-style dinner at the acclaimed Shelby Museum in South Las Vegas. Sunday the drivers would once again run head to head this time in the Powerstop Brakes Speed Stop Challenge and have multiple run sessions in the Falken Tire Hot Lap Challenge on the road course. This updated format really levels the playing field by giving each driver similar if not the same track conditions. And let’s face it, these drivers are competitive so this format really works! 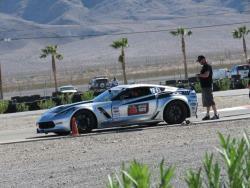 The weather was the best our drivers have seen in years out at Las Vegas Motor Speedway. Track conditions were ideal, making competition closer than ever. Best of all our AIRAID team drivers left everything out on the track. As predicted there were plenty of Corvettes that were top finishers, that dominated the field. Priestley finished 4th in the GTS Class with his 2017 Chevrolet Grand Sport C7, Bernice, earning him an 11th place finish overall. 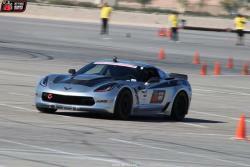 But this year it wasn’t a Corvette that took the Championship. No, it was none other than AIRAID team driver Ken Thwaits in his 2006 Mitsubishi EVO that was crowned the OUSCI Champion this year. To make things even sweeter, he also walked away with the GTL Class Title. Thwaits and the Showtime Motorsports Team worked hard and their dedication and determination yielded a very sweet victory, one they can be very proud of. You might even call this a “Cinderfella” story!